Just when you thought adding bacon to everything was passé, Baron’s Eats, the newly opened sandwich-shop offshoot of the Baron’s Meat & Poultry butcher shop inside the Alameda Marketplace (1650 Park St.), is offering a new bacon-studded contender to the local burger game. The “5150” Bacon Burger is 50 percent BN Ranch grass-fed ground beef and 50 percent Niman Ranch uncured maple bacon ground right into the patty itself. 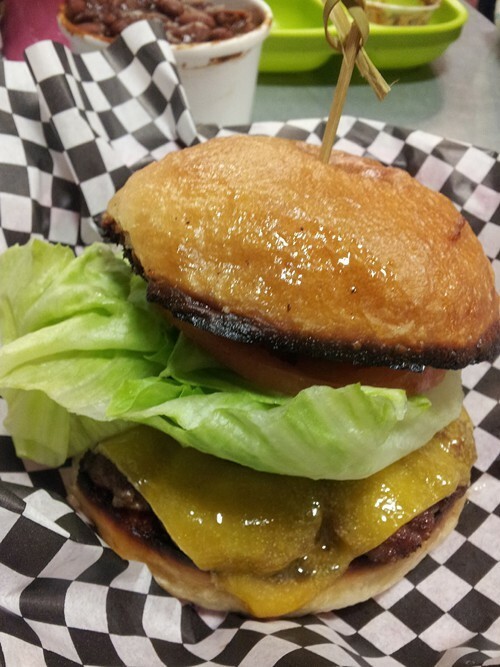 The result is one extremely rich, fatty burger — tasty enough to merit a special trip over to Alameda. Owner Dave Samiljan and chef John Coucaud aren’t the first meat alchemists to mix bacon into a beef burger patty — Southern California has an entire restaurant chain dedicated to that 50/50 mix (Slater’s 50/50), and the Oakland sausage-and-beer garden Telegraph also serves a version. But the half-bacon burger sold at Baron’s is especially well executed. All of the shop’s burgers, including the 5150, are cooked using the “smash-and-griddle” method, popularized by places like New York City’s Shake Shack and the Denver-based chain Smashburger. The technique involves taking raw meat that’s shaped into a big meatball and smashing it onto the hot flat-top, which results in a strikingly thin, but still juicy, burger patty with a nicely charred exterior. Of course, the bacon fat — which Samiljan guessed might push the patty’s overall fat content up to around 35 percent — assures that, if anything, this burger has a surfeit of meaty juices. The other burger components — a well-griddled Feel Good Bakery bun, crisp cold lettuce, tomato, and mayo — were simple but uniformly excellent. Baron's Eats is open from 11:30 a.m. to 8 p.m. Monday through Friday, and from 11:30 a.m. to 7 p.m. on Saturdays and Sundays.